Annies Home a place where I love to share tips, recipes and wonderful products that I find for our family along the way. As a mom I strive to find the best for all of my children. Now as a grandmother and an aunt I try my best to ensure that they are introduced to awesome products as well. On this list of great products for little ones you will find many products from MAM. MAM products are designed to satisfied both stylistic requirement and functional needs. MAM products are as unique as the little ones they are designed for. Every MAM creation is designed with medical and technological expertise. Internationally renowned scientists, medical practitioners, midwives and development psychologists work together with designer sand technology specialists in the MAM studios. Ensuring that MAM products are developed to ensure that the combination of style, technological innovation and medical know how produces unique premium products. MAM is the leading designer brand for baby accessories. Parents choose to buy a MAM product on more than 40 million occasions around the world every single year. 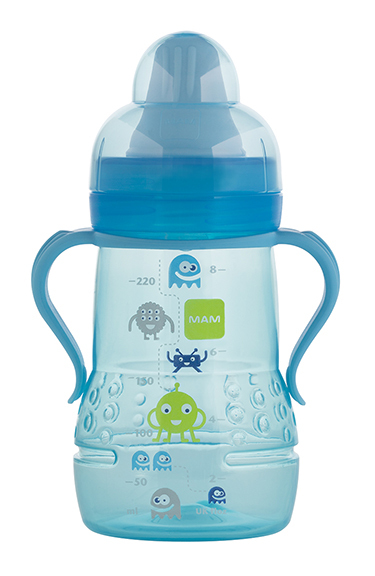 MAM training cups combine form and function to successfully help babies learn to drink from the standard glass. I love that the old fashioned bottle form is gone and has now been replaced by a new form which resembles a cup. Each cup is ergonomically designed to fit baby sized hands, making them easy to grip and hold and in my personal opinion sets them up for a bit of independence at an early stage. I also love the idea of the spill proof spouts perfect the little ones on the go. MAM training cups are available in an assorment of colors and designs. All MAM products are BPA free, PVC free, lead free and CPSIA - compliant. Easy to care for because they are dishwasher safe and specially formulated to withstand steam sterilization in the microwave. MAM Trainer features small handles which are ideal for babies learning to become more independent. Soft spout helps ease baby's transition from sucking to drinking. Available in 8 oz. size perfect for babies ages 4+ months. MAM Learn to Drink Cup with Soft Spout perfect for those little ones transitioning from breast or bottle to training cup. Features a soft spout and a slim shape that allows for an easy grip. Available in 6 oz. size perfect for little ones 6+ months. 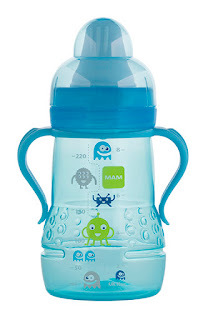 MAM Learn to Drink Cup with Hard Spout designed to teach babies to drink from a regular cup. Features a hard spout to help prepare baby for the next phase of development. Available in 9 oz.size and perfect for babies 8+ months. We were able to review the trainer cup from MAM. I love this product perfect for those little hands and don't worry the spout is spill proof so little spills are less to happen. I love the cute design that was on the trainer cup so super cute. My thoughts are who would not love the little trainer cup. Disclaimer: I shared my personal opinions in this post. I did receive a product as indicated in the post. The opinions I shared were not in any way influenced by any source. Recently I was able to get in touch with an amazing lady named Bonnie. Bonnie is the owner of a website that is dedicated to handmaking gorgeous Bridal Jewelry, Bridesmaid Jewelry and any type of Wedding Jewelry that you would want included in your special day. Bonnie also has been inspired to make amazing jewelry that is perfect for perfect days like prom, graduation and dont forget Mom and birthdays all year long. We were sent this beautiful cape starfish necklace. This beautiful necklace can be customized to match your outfit and be the perfect piece to attract others attentions. Another great reason I love Bonnita J is because you can customize your jewelry to the perfect color. The beautiful variety of pieces available are simply amazing and delicate looking. BonitaJ has a full line of products to choose from. Earrings, necklaces, bracelets, Tiaras, haircombs and pins. I simply love the necklace that I was sent and would be proud to wear it myself or give it as a gift. It would make a perfect gift to any graduate, bride, mother or anyone who simply needs a pick me up. The jewelry is constructed well while looks delicate in construction. I hope that you take few minutes and head over to her site whether you are looking for Wedding Jewelry or gifts for your Bridesmaids or not. Anyone you know that is special enough to get something beautiful deserves a piece from BonitaJ. I know you will not be disappointed in your selection! BonitaJ is allowing us to do a giveaway for a $20 gift card to purchase any product on the bonita J website Here's how to enter! Mandatory Entry - Please go over to BonitaJ and take a look around. Come back here and let us know what piece of jewelry caught your eye. Earns 2 Entries: Follow BonitaJ on Twitter. Disclaimer: I did receive a product to use to create this post. I shared my own opinions and was not influenced by any source to share opinions other than mine. Graduation is a very special time for all involved. I am so glad to see that the Charm Factory is having a grad sale where you can save 15% off your order. Get the perfect charm to show your pride for your graduate. Signet Complete Chair featured on The Ellen DeGeneres Show’s annual Mother’s Day show on May 10, 2013. To prepare 1 quesadilla, arrange 2 slices of cheese on 1 tortilla. Top with 2 slices of ham. Spread with 1 1/2 tbsp. mustard, then top with another tortilla. Prepare 3 more quesadillas with remaining ingredients. Place 1 quesadilla on a microwave-safe plate. Microwave on HIGH for 2 minutes or until cheese melts. Repeat with remaining quesadillas. Slice into wedges before serving. Serve with extra mustard for dipping. Are You An Eggland Best CEO?? ?